Largest gathering of bald eagles in North America. Some 4,000 eagles come to the Chilkat River near Haines in November to feed on a late run of salmon there. The coldest temperature ever recorded in the United States was in Alaska. On January 23, 1971, the temperature dropped to -79.8 (often rounded up to -80) at Prospect Creek. That's only one degree warmer than the coldest temperature ever in North America. On February 3, 1947, the thermometer at Snag in the Yukon hit -81.4 degrees Fahrenheit. The coldest temperature recorded in the world is -129F at Vostok, Antarctica on July 21, 1983. Alaska's record warm temperature of 100 degrees at Fort Yukon on June 27, 1915 doesn't come close to the record in North America of 134 degrees at Death Valley, California on July 10, 1913. The warmest temperature in the world was just two degrees warmer, 136 in Libya on September 13, 1922. Juneau, Alaska is the cloudiest place in the U.S. The National Climate Data Center shows that folks have a 30% chance of seeing the sun there. Anchorage and Nome also make the list of the top five cloudiest places. Anchorage tied Hilo, Hawaii for the #2 spot at 41%. Nome at 42% sunny was #4. Yakutat, Alaska holds the record for the rainiest place in the United States. It averages more than 160 inches each year. The record snowfall in Alaska was set at Thompson Pass, north of Valdez the winter of 1952-1953. That year 974.5 inches of snow fell there. That is well below the record for the United States of 1,140 inches set at Mount Baker during the winter of 1998-1999. In Alaska you'll find the windiest places and the least windy. 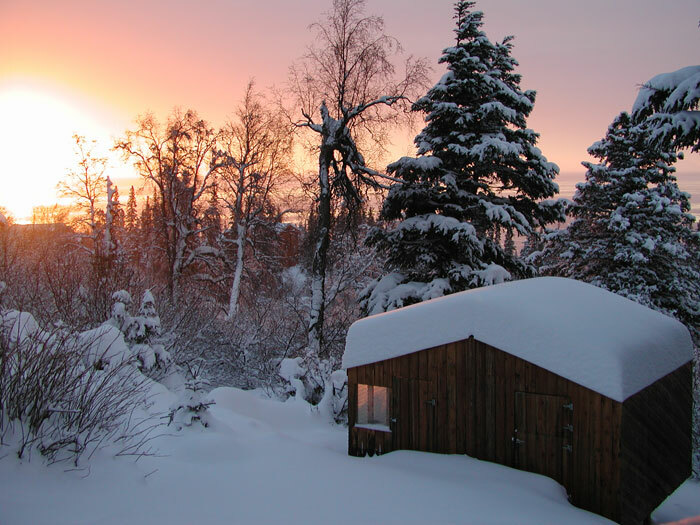 Talkeetna ties Medford, Oregon for the lowest annual wind speed of 4.8 mph. McGrath is also calm with only an annual wind speed of 5.1 mph. 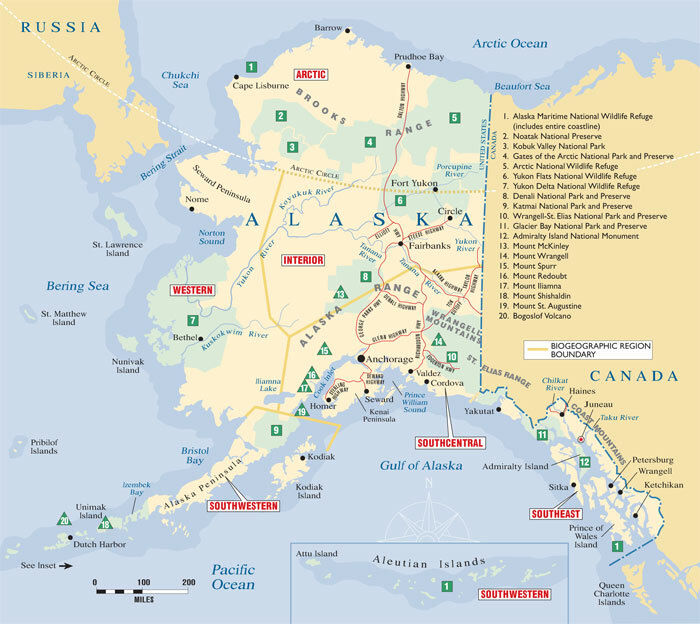 Alaska Northwest Books and the map is used with permission of Alaska Northwest Books, an imprint of Graphic Arts Books, P.O. Box 56118, Portland, Oregon 97238-6118. 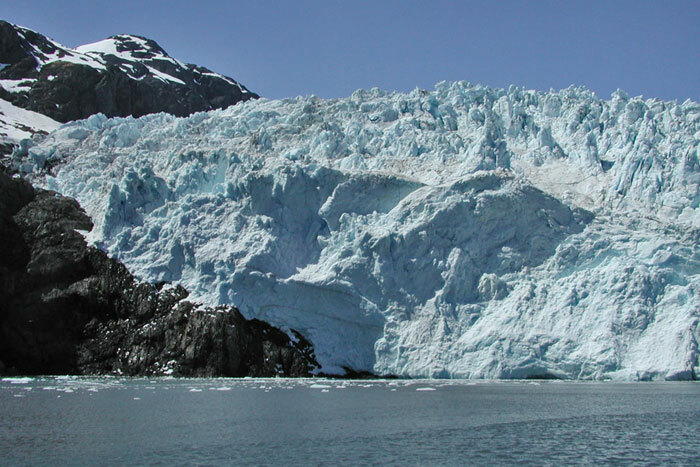 Wood-Tikchik State Park is the biggest state park in the U.S.
You’ll find more glaciers in Alaska than anywhere else in North America. 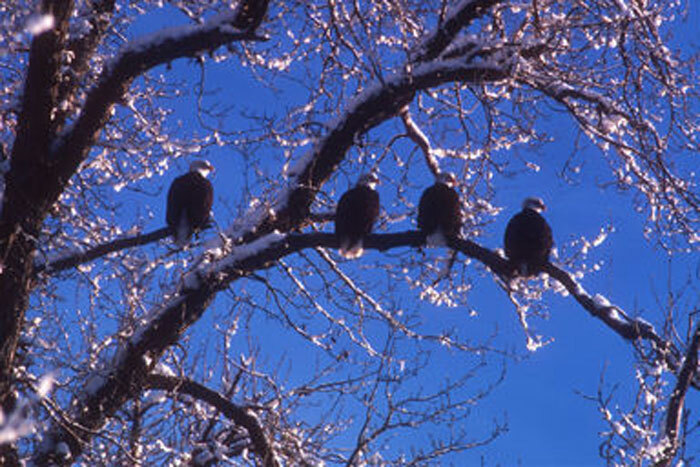 Eagles gather at the Chilkat River for a winter salmon fest. 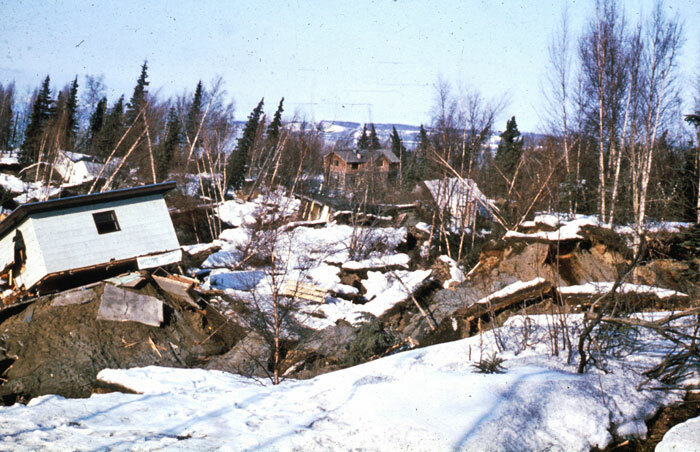 Damage from 1964 earthquake in Alaska. 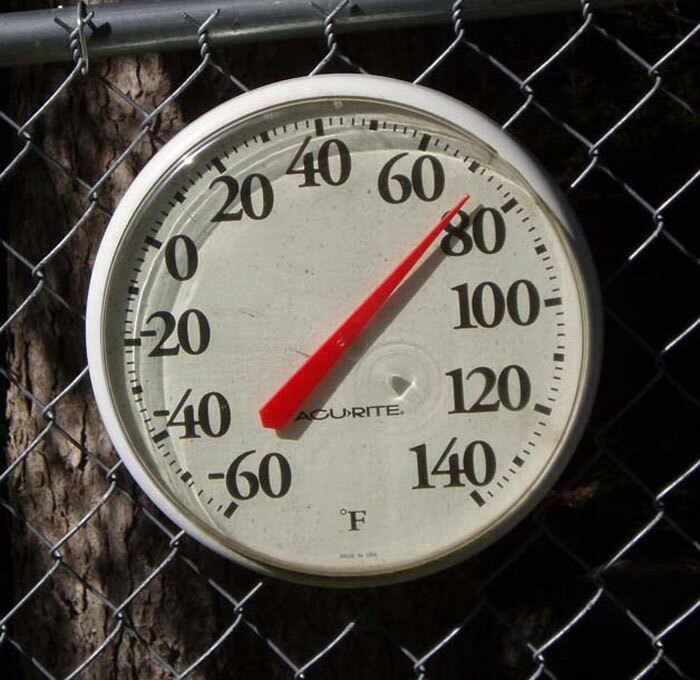 The temperature rises to the mid-70s in June 2009 in Anchorage. The record high temperature of 100 degrees was set in 1915 at Fort Yukon. Mt. 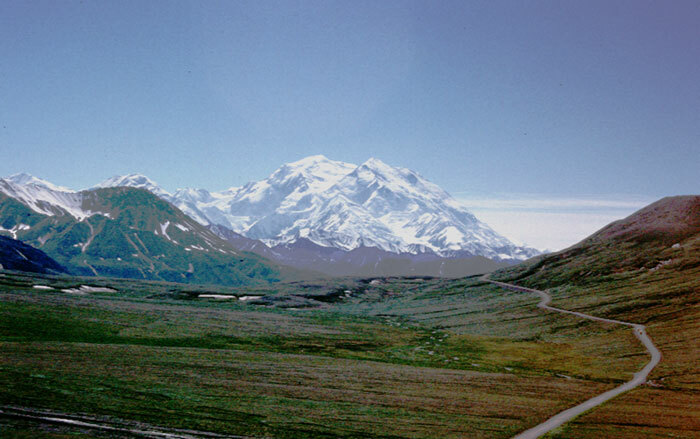 McKinley, tallest mountain in North America. Mt. 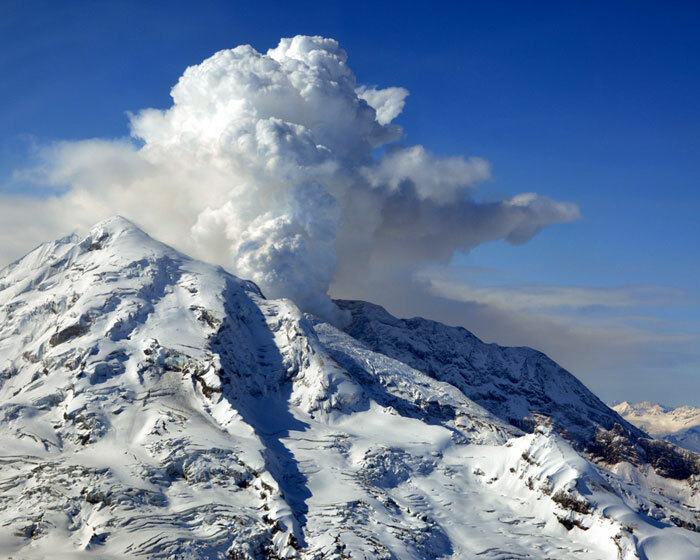 Redoubt, just one of many active volcanoes in Alaska. The sun sets at 3:41 p.m. on the shortest day of the year in Anchorage. Copyright © 2000 - 2019. All rights reserved. University of Alaska Anchorage.